The recording isn’t perfect but it’s a good approximation, and I really want to get back in the habit of putting my talks online. I was a little ill when I did this recording but things tend to get forgotten about otherwise. The day after EGX I travelled to New Scientist Live, the first New Scientist event ever, to give a talk on their Technology stage. The talk was titled The Digital Muse and it was all about what life will be like in a world full of generative software. I haven’t recorded this one for YouTube yet but I promise I’m trying to get it up soon. Thanks to everyone who came to both talks (both of them were packed!) 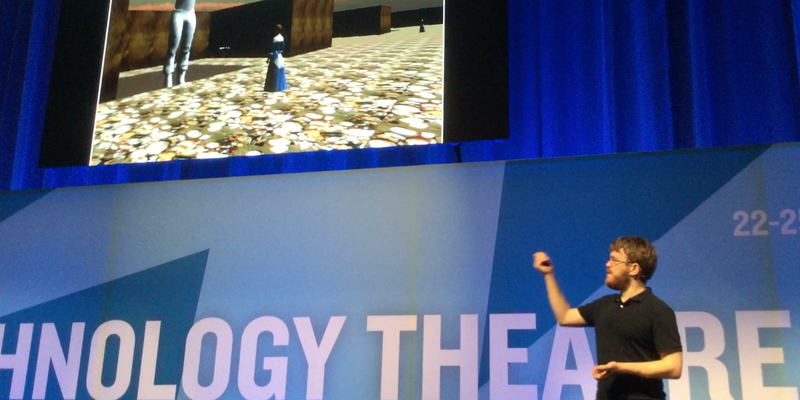 and thanks to Eurogamer’s Jon Hicks and New Scientist’s Gilead Amit for letting me give those talks. Azalea took some awesome photos and videos of the talk! When I first planned my New Scientist Live talk, I wanted to give the audience an idea of what procedural generators would be like if they were an artistic medium that anyone could play with (in the talk I mentioned Cheap Bots Done Quick, which is one of the few accessible ways to play with digital generators). The closing flourish for the talk was going to be a personalised mini-generator for everyone in the audience. It wouldn’t be a big generator – maybe 70 possibilities for each one, and many of them would share templates or palettes. But each one would technically be a little unique generator to make everyone think about generators a bit differently. Making 400+ different generators, even if they share parts, is no mean feat – but I had a plan, which was to build small generators that could be composed together to make more complex ones. So some people get an animal generator, and other people get a flag generator, some of which have animals on. Or a crest generator, some of which have animals on, or some have flags on, and so forth. By reusing generators as much as possible (and keeping them fairly small and simple) I estimated I could just about create enough procedural generators. Ultimately I had to put the project aside – it was taking up too much time at a very stressful time of year, and I couldn’t work out a satisfactory way of sharing the generators with each audience member. I might try the project again for a future talk, with more experience, but for now I’ve released all the code and the little image templates on GitHub. There’s so much stuff still happening – I haven’t told you about the book, really, or how PROCJAM’s going, or Rogue Process, oh my goodness. So much is going on. Keep in touch via Twitter and I’ll try and do another update real soon. Take care!